Miles College is a four-year, private, coed, liberal arts institution founded as Miles Memorial Coll…. 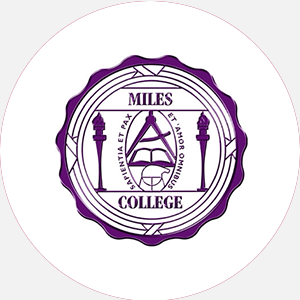 Miles College is a four-year, private, coed, liberal arts institution founded as Miles Memorial College in 1905 by the Colored Methodist Episcopal Church, which is now called the Christian Methodist Episcopal Church (CME Church). The Alabama and the North Alabama conferences each established educational institutions in Thomasville in 1898 and another at Booker City in 1902. The high school operated at Booker City by the North Alabama conference is considered to be the roots of Miles College. The reorganization of the school began in 1907, when it became a college and moved to its present site. In 1908, the school was chartered under the laws of the State of Alabama as Miles Memorial College in honor of Bishop William H. Miles, a former slave and ex-minister in the postwar missions of the African Methodist denominations. The first baccalaureate degree was awarded in 1911, the same year the Board of Trustees changed the name to Miles College. Miles College was the only four-year college open to black students for the first half of the twentieth century. Miles’ original mission, to provide quality education for the academically disadvantaged and to provide community service, continues today. In keeping with the religious origin and liberal arts tradition, the College assists students in acquiring respect for religious creeds in general, and for the Christian ethnic in particular. The school urges students to fulfill their human and intellectual potentials, and to develop the skills in communication and scholarship necessary for productive lives in American mainstream society. Comprising seventeen buildings, Miles College rests on 35 acres, about 6 miles west of downtown Birmingham. Miles College is accredited by the Southern Association of Colleges and Schools to award the Bachelor of Arts and Bachelor of Science degrees. Graduation from high school with a minimum of 15 units, including 3 English, 1 history, 3 mathematics, 3 natural science, 3 social science, 2 foreign language, and electives (not more than 2 units); official high school transcript; three letters of character recommendations (one from counselor or teacher); completed medical form by physician; proof of immunization against vaccine-preventable disease. A nonrefundable application fee is required. Admission Application Deadline: August 15 (Fall); January 15 (Spring) Admission Contact: Director of Recruitment and Admissions, Miles College, PO Box 5800, Birmingham, Alabama 35208; Telephone: 205-929-1656; 800-445-0708 (toll-free); 205-929-1627 (fax). A minimum of 124 semester hours for bachelor’s degree including the following hours: 6 mathematics, 6 science, and a computer course for all students; students must complete 30 hours in residence. Campus Regulations: Class and church attendance are required; must maintain a 2.5 GPA to join social organizations; on-campus residents must purchase a meal plan. Campus Services: Health, personal and psychological counseling, tutoring, and student support. Campus Activities: Social activities include theater, the College Concert Choir, concerts, band, and dances. Students may work on Columns (student newspaper) or the Milean (yearbook). Leadership opportunities are found in the Student Government Association; the prealumni counsel; the student library action committee; or the various other departmental, social, and service organizations. Greek sororities include Alpha Kappa Alpha, Delta Sigma Theta, Sigma Gamma Rho, and Zeta Phi Beta; fraternities include Alpha Phi Alpha, Omega Psi Phi, Kappa Alpha Psi, and Phi Beta Sigma. Honor societies include Alpha Kappa Mu. Bachelor of Arts: English, English Literature, History and Government, Music, Political Science, Social Sciences Bachelor of Science: Accounting, Biology Education, Business, Business Administration, Chemistry/Chemistry Education, Communications, Elementary Education, English Education, History Education, Language Arts Education, Mathematics Education.